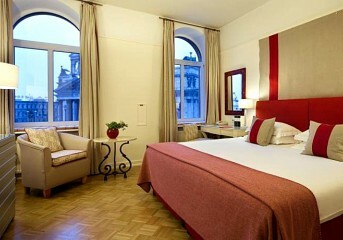 Prepare to savor your time during a stay next to Kremlin and Nevsky in the remarkable 5-star hotels. Immerse yourself in the beauty of two Russian capitals with the luxury creme-de-la-creme tour as you explore the Armoury Chamber in Kremlin, see the Tretyakov Gallery, the Hermitage Museum and its famous Diamond Room, housing the collection of the royal Romanov family, see Peterhof and Catherine's Palace, go on a guided tour of the Faberge Museum and have fun during a private boat ride along St. Petersburg canals. We have planned a perfect combination of expert touring and activities, so you can experience the best of Russia with local pro guides. Welcome to the glorious capital of Russia - Moscow! Your private driver and our representative meet you at the airport and transfer you to your centrally located hotel for check-in. In the evening you meet you guide and driver at the hotel lobby and head for the restaurant, where you enjoy a welcome dinner that provides you with a great opportunity to get acquainted with your guide and discuss the exciting journey that awaits you ahead. Following breakfast you meet your guide at the hotel lobby and have a wonderful city tour around the most magnificent Moscow landmarks. During the tour you take a walk at the beautiful Red Square, go inside the colorful St. Basil's Cathedral, admire a beautiful facade of the famous GUM department store, see the spectacular Cathedral of Christ the Savior (if time allows) and enjoy one of the best city views at Sparrow Hills. Later you enjoy lunch in a local restaurant followed by a visit to the world-famous treasure trove of the Russian fine art, the Tretyakov Gallery, where you view the gems of its collection, including the famous masterpieces of Ivan Aivazovsky, Mikhail Vrubel and Viktor Vasnetsov. After the tour you are transferred to your hotel and have the rest of the day free. After breakfast you have a wonderful sightseeing tour devoted to the exploration of a real Russian miracle and its most famous symbol - the mighty Kremlin. You have a guided tour of this historical fortress, where you visit the famous Square of Four Cathedrals and go inside one of its gorgeous cathedrals decorated with magnificent frescoes. Your tour also includes a visit to its wonderful Armoury Chamber that houses a unique collection of crown jewels, stunning coronation finery, hand-forged armor and weapons, royal carriages and sleighs, and world-famous Fabergé eggs. Following breakfast, you enjoy discovering one of the most interesting sites in Moscow hidden deep beneath the surface - the Moscow Subway. You have a quick subway ride to taste local life and enjoy the splendid decorations of its stations. After the Subway ride, you head to the famous Bunker 42 for a private tour. There you explore the bunker, see the imitation of the nuclear missile launch, observe Stalin's office and conference room. Note: descending and ascending from the depth of 65 meters is carried out on foot, so people with disabilities and children under the age of 8 are not allowed to enter the territory of Bunker 42. After the tour, you are transferred to your hotel and have the evening at leisure. Today upon check out from your hotel, meet your guide and driver and head for the railway station. There you board the modern high-speed Sapsan train that takes you to St. Petersburg in comfort and safety in just 4 hours. Upon arrival you guide and driver meet you at the station platform and take you to your centrally located hotel for check-in. After check-in enjoy a Welcome cocktail at the hotel with your guide and fellow travelers and discuss the upcoming exploration of the Venice of the North. Breakfast and welcome cocktail included. After breakfast you meet your guide at the hotel lobby and go on an amazing panoramic city tour around the most cherished gems of St. Petersburg, including Palace Square, the Hermitage Museum, the Mariinsky Theater, Nevsky Prospect and many other popular attractions (no entrances included). After lunch you visit the Peter and Paul Fortress - a burial place of almost all the Russian emperors and empresses from Peter the Great to Nicholas II and his family. Then you go inside to the magnificent St. Isaac's Cathedral and the Church of the Savior on Spilled Blood, which stands where Russia's great emperor Alexander II was mortally wounded. Following breakfast you meet your guide at the hotel lobby and go to the legendary Hermitage Museum before hours to avoid large crowds. Hermitage houses its unique collection of world art, including the masterpieces of Leonardo da Vinci, Rembrandt, El Greco, Francisco Goya and Thomas Gainsborough in the halls of the Winter Palace. You also go inside the famous Diamond Room, that contains the unique collection of priceless gems belonging to the Romanov family as well as visit the General Staff Building to admire the Hermitage's superb collection of Modern European Art, primarily consisting of the world-famous French impressionist and post-impressionist paintings. After breakfast you meet your guide at the hotel lobby and travel to the outskirts of St. Petersburg to explore the former summer residence of Russian tsars and the gem of palace architecture - Peterhof. During the tour you visit the famous Bath Cottage, which offers a fascinating insight into everyday life of Russian court, and take a walk in the beautiful Lower Park, lavishly adorned with 176 fountains of various forms and styles and numerous gilded statues of ancient gods and heroes. The highlight of the tour is a unique hydrofoil ride back to Saint Petersburg. Following breakfast you meet your guide at the hotel lobby and head for Pushkin (Tsarskoye Selo) to explore the brilliant Catherine's Palace that is a striking example of baroque architecture gifted by Peter the Great to his wife Catherine I. During the tour you walk through the lavish parks and gardens of this outstanding palace and enjoy its gorgeous interiors, including the replica of the world-renowned Amber Room. After the tour you return to your hotel in Saint Petersburg and have the rest of the day free. After breakfast your guide meets you at the hotel lobby and takes you to one of the the most beautiful palaces in Saint Petersburg - the Shuvalov Palace located on the Fontanka River to show you the world's largest collection of works by Carl Faberge, including nine of the famous Imperial Easter Eggs, regarded not only as the finest jeweled works of art, but also as unique historical artifacts. A private boat ride along the beautiful canals and rivers of the Russian Northern capital comes as a final chord to your exploration of Saint Petersburg. After the tour you return to your hotel. In the evening you enjoy Farewell dinner in a company of your guide and fellow travelers. This is the final day of your amazing Moscow - Saint Petersburg tour. After breakfast you check out from your hotel, meet your guide and driver and head for the airport for your flight back home. We hope you have enjoyed both magnificent Russian capitals and return home with lifelong memories and unforgettable impressions. We wish you a safe flight and hope to work on your future trips! Relaxed pace with at least 4-nights stay in each city with sufficient time to immerse yourself in the local culture.